Glycosides come under very important class of drug from the point of view of GPAT. There are many glycosides which are useful for human beings for treatment of various medical conditions. Out of these glycosides, I have selected the most important glycosides which are widely in use worldwide in the traditional systems of medicine. Along with these glycosidal drugs I will also suggest readers to also study the general pharmacognosy and classification of glycosides to have full command on the topic. Digitallis is obtained from the leaves of digitalis purpurea belonging to the family scrophulriaceae. The name to the plant was given by Fuchus in 1542. Leaves of digitalis are dorsiventral with anomocytic stomata. Digitalis contain uniseriate, multicellular & blunty pointed trichomes. Collapsed cell covering trichomes is an important characterstic of digitalis. Ca oxalate and sclerenchyma is absent in digitalis. Starch grains are present in endodermis. Nativell, Killani & Stoll gave the chemical constituents of the digitalis drug. Digitalis contains 0.2 to 0.45 of total caedenolides. Digitalis contains purpurea glycoside A & purpurea glycoside B which on hydrolysis give 1 molecule of glucose and respective sugars. 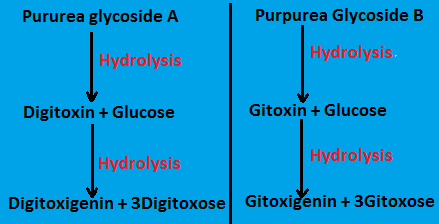 Purpurea glycoside yield 3 molecules of digitoxose and 1 molecule of digitoxigenin whereas, purpurea glycoside B yields 3 moloecules of gitoxose and 1 molecule of gitoxigenin. Hydrolysis of purpurea glycosides A & B.
Primorsa leaves (Primorsa vulgaris)- Uniseriate covering trichomes. Latera veins are straight. Comfrey leaves (Symphyticum officinale)- Multicellular trichomes forming hook at the top. Assay of digitalis is done by alar vein of pigeon & jugular vein of pigeon. Digitalis lanata is the allied drug of the digitalis purpurea having lanatosides as chemical constituent. Lanatoside C produces digioxin. As, digitalis is an important topic from the point of view of GPAT, so i will suggest my readers to study the chemistry & pharmacology of cardiac glycosides also to have a depth knowledge of the topic. Indian senna is also known as tinnevelly senna is obtained from the dried leaflets of cassia augustifolia belonging to the family leguminosae. Alexandrian senna is obtained from the cassia augustifolia and have ovate-lanceolate leaves. Trichomes are unicellular, conical & thick walled warty type. Stomata of senna are rubiaceous or paracytic. Presence of cluster sheath and collenchymas is characteristic feature of senna leaves. Sennosides A & B are chief constituents of senna leaves in the minimum concentration of 2.5%. Both sennosides A & B are stereoisomers of each other. Sennosides are dimeric glycosides. Aglycone moiety of sennosides is known as rhein dianthrone. Palthe Senna (C. auriculata)- Contains no glycosides. Assay of senna is done by assessing the no. of wet feces produced by the group of mice in 24 hours. Structure of anthron & Anthranol. Anthrone is pale yellow substance which is not soluble in alkali and also doesn’t give any fluroscence. Anthranols on other hand are soluble in alkali & gives strong fluroscence in alkali. 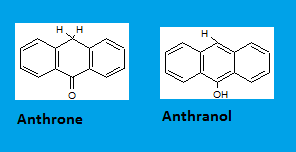 Anthrones and anthranols are differentiated on the basis of fluroscence test. Aloe is obtained from the aloe barbadensis (curacao), aloe perryi (socotrine) and aloe spicata (cape) belonging to the family liliaceae. Leaf of aloe is sessile. Ca oxalate and cuticle is present in the leaves. Lactophenol reagent is used for the microscopy of aloe powder. Ø Curacao- Fragments of small needle like prisms. Ø Cape- Angular or irregular fragments. Ø Socotrine- Quite large prisms. Chief constituent of aloe is aloin which is a mixture of glucosides. Barbaloin is the main constituent of aloin. Chemically, barbaloin is aloe-emodin anthrone C-10 glycosides. Aloescin is responsible for the purgative action of aloe. Chemical tests for aloe come in two categories; general tests for aloe and special tests for aloe. a) General tests for aloe- There are two general tests for aloe which confirms their presence in the compounds. i) Bromine test- With bromine aloe forms yellow precipitate due to the presence of tetrabromalin. ii) Schoententen’s test- This is also known as borax test. Aloe gives green fluorescence with borax. b) Special tests for aloe- These 3 tests come under the category of special tests for confirming or differentiating different types of aloe from one another. i) HNO2 test- HNO2 is formed by reacting NaNO2 with CH3COOH. Different varieties of aloe give following results with HNO2 test. Socotrine & Zanziber- Vaer less change in the color. This test is done due to the presence of isobarbaloin in the different varieties of aloe. ii) Nitric acid test- Different response given by the varieties of aloe to the nitric acid is as follows. iii) Cupraloin (Klunge’s isobarbaloin test)- In this test first CuSO4 is added followed by NaCl and excess of 90% alcohol. Results of the different reagents for the cupraloin test are as follows. Liquorice is obtained from the dried roots and stolon of Glycirrhiza glabra belonging to the family of leguminosae family. At present there are three accepted varieties of the aloe in the market. Peeled drug is fibrous without wrinkles. a) G. glabra var typical (Spanish)- Large number of stolon. b) G. glabra var glandulifora (Russian)- No stolon. c) G. glabra var violecea (Perssian)- Violet flowers. Unpeeled drug of liquorice shows the presence of polyhedral tubular brownish cork cells. Starch and cork cells are present in parenchyma. In stolon, pith is present & is parenchymatous. Root is characterized by the presence of tetrarch xylem & absence of pith. Glycirhizin is the main constituent of liquorice which is a triterpenoid saponin. Chemically, glycirhizin is K & Ca salt of glycirrhizinic acid. Amount of glycirhizin present in the liquorice ranges from 6 to 14%. On hydrolysis, glycirrhizinic acid gives glycrrhetinic acid. Liquiritin & Isoliquirin are two flavonoids present in the liquorice in traces which posses antiulcer and antigastric properties. Chemical test for liquorice- liquorice is tested chemically by 80% H2SO4; yellow color confirms the presence of liquorice. Rhubarb is obtained from the dried rhizomes of Rheum emodii (Indian), R. Palmatum and R. webiannum (chineese) belonging to the family polygonaceae. i) Anthraquinone with COOH group- Rhein & glucorhein. Astringent constituent in rhubarb is gallic acid (Glycogallin). Rhaaptonic rhubarb (R.rhapontium) contains rhaponiticin which has estrogenic activity & shows blue fluorescence in UV light. Cascara is obtained from the bark of Rhamnus purshiana belonging to the family rhamnaceae. Cork cells give yellow color with alkali. Ca oxalate is present in parenchyma. Cortex also contains group of scleroids. Cascara mainly contains C-glycosides but O-glycosides are also present in traces. Glycosides are called cascarosides. Dioscorea is obtained from the tubers of dioscorea deltioda belonging to the family dioscoreace. Stele is the major part of the drug. Endodermis & pericycle are indistinguishable. 75% of the dioscorea is starch which is bitter in taste. Steroidal saponin diosgenin is also present in the range of 4-6%. Diosgenin is the hydrolytic product of dioscin. Diosgenin is the precursor for the synthesis of many steroidal hormones.